After the hard work of the volunteers, the new trail is clean and serene, but offers enough challenges to keep the ride fun. 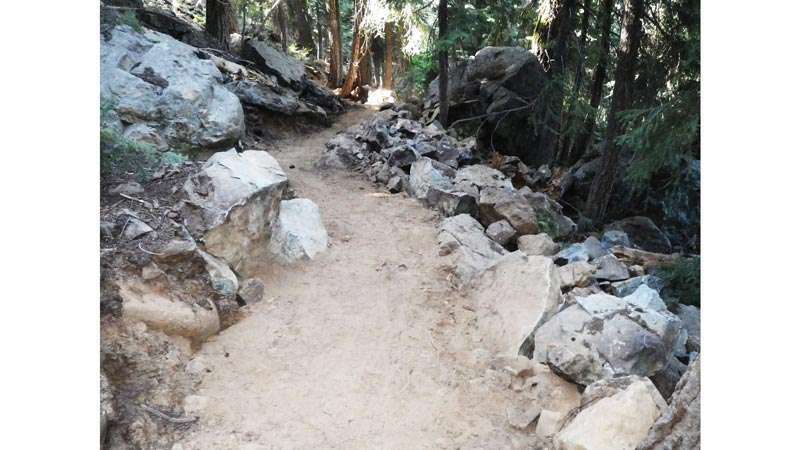 After years in the making, the Sierra Buttes Trial Stewardship has finished the acclaimed Mills Peak trail in the Lakes Basin area. 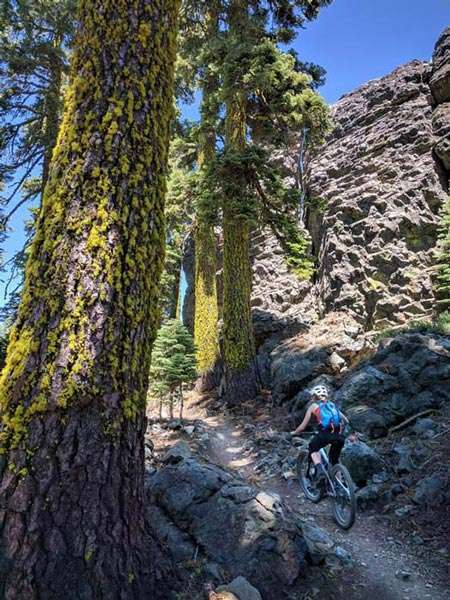 Since its inception in 2003, the Sierra Buttes Trail Stewardship has been pioneering new trails that has put Plumas County on the map as a mountain biking destination. The Mills Peak trail was one of the first trails the stewardship created that impacted the Plumas County systems. 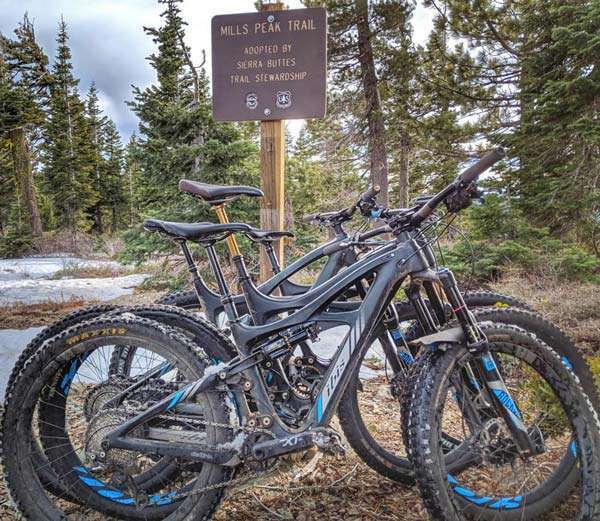 Now the 9 mile muti-use single track that takes the user to the top of the peak, a 3000-foot climb, is an established must-see in the county’s trail systems. Though the trail has essentially been usable for years, there were bits of the trail that entailed the use of logging roads, which is not only hard on a bike, but also unsightly. The stewardship just finished a 1.7-mile single track that bypasses those roads and creates a serene and moderately challenging trail. The Stewardship was created in 2003 and has been very successful in acquiring grants, partnerships, and fundraising to enable the creation of new trails. Their very successful Trail Daze has garnered a pool a volunteers who come from all over, though many are local, to cut mazanita and build trails. 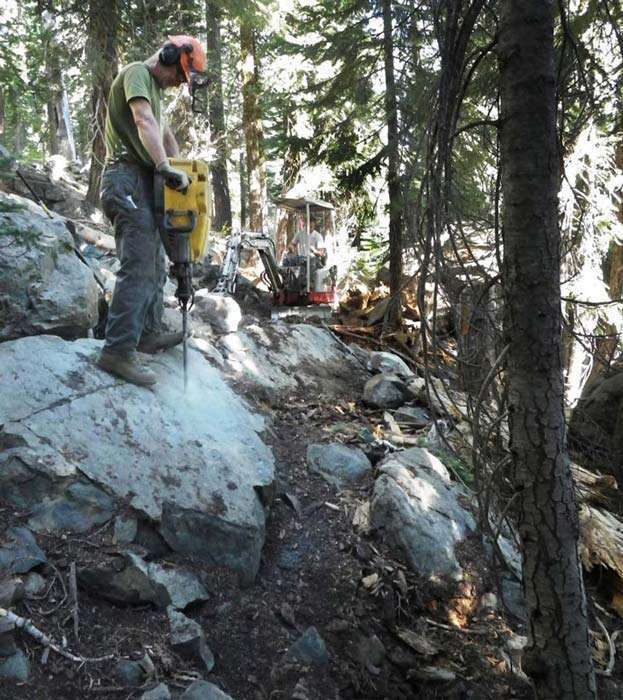 The Mills Peak trail’s hard ground created a challenge for those volunteers, even snapping the steal arm off “Old Wobbly,” the trusty trail dozer that had tackled over 800 miles of trail before its accident. The trail’s completion is something to be celebrated both for the Stewardship and for the community. The inspiration has come to the community. Members of the Graeagle and Eastern Plumas County area are already noticing a change in the visitor demographic. Graeagle Real Estate agent Leah West reported an increase in second home buyers who came up to the area to bike. Many of them are younger people and some are even world acclaimed bikers. The Stewardship is currently working on more trails including one on Mount Hough in Quincy. They also put on three biking events in the area to help promote tourism and trail awareness. Sierra Buttes Trail Stewardship volunteers tackle the rocky terrain to develop a single track trail. A rider climbs up the 9-mile Mills Peak trail with an elevation increase of 3,000 feet. The trail is now a very popular trail for mountain bikers. Bicycles should not be allowed in any natural area. They are inanimate objects and have no rights. There is also no right to mountain bike. That was settled in federal court in 1996: http://mjvande.info/mtb10.htm . It’s dishonest of mountain bikers to say that they don’t have access to trails closed to bikes. They have EXACTLY the same access as everyone else — ON FOOT! Why isn’t that good enough for mountain bikers? They are all capable of walking…. A favorite myth of mountain bikers is that mountain biking is no more harmful to wildlife, people, and the environment than hiking, and that science supports that view. Of course, it’s not true.